Pasta of excellence in a prestigious yearbook! Your pasta featured in Eccellenza Pastaria 2016! Eccellenza Pastaria is a prestigious volume which aims to bring together the best Italian and international pasta products available. Eccellenza Pastaria is edited by the Italian trade magazine Pastaria. It comes as an elegant catalogue of quality products, each one different from the next, laid out in alphabetical order. Each product is presented on a double page spread alongside an exhaustive description, the list of ingredients, a beautiful photo of the product and one of its packaging, a technical data chart, the company logo and details of the manufacturer, not forgetting the contact details of the sales managers. The text is in both Italian and English. A great new aspect awaits international manufacturers! The 2016 edition of Eccellenza Pastaria is now also open to pasta makers from all over the world. Don’t miss your chance to represent the excellence of pasta produced in your country, to associate your brand with the best noodles, the tastiest pelmeni, the most sought after soia spaghetti or the most fantastic pasta shapes. Place your products alongside the most famous brands produced by Italian pasta makers. Great discounts applicable for the first manufacturers of each country given a place in Eccellenza Pastaria. Eccellenza Pastaria 2016 will be distributed to buyers (HORECA channel, large retail outlets, traditional traders) attending the most important food sector trade fairs held between May 2016 – April 2017. If you are a trade fair organizer operating in the food sector and you want to give your buyers a copy of Eccellenza Pastaria, request your free copies here. 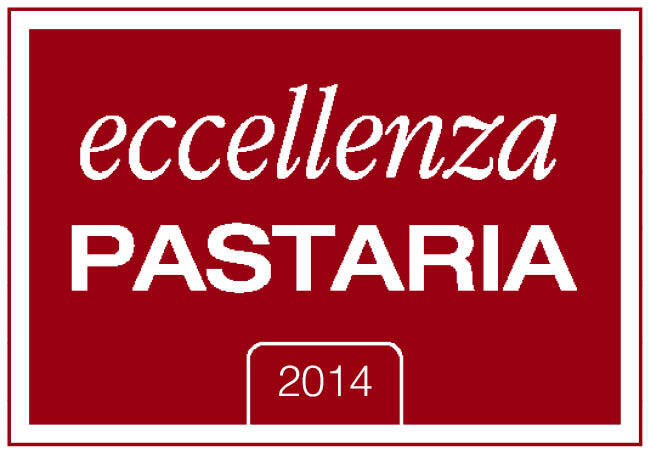 Inclusion in Eccellenza Pastaria 2016 brings with it the right to use the specially created Eccellenza Pastaria 2016 seal which refers to products included in the edition. You can use our seal in your sales brochures, catalogues, your website and, if you wish, even on your packaging. Submitting your products for inclusion in Eccellenza Pastaria 2016 couldn’t be easier. Simply fill in the form at the bottom of this page, indicating which are your best products, i.e. those which best represent the quality of your production. Your submission will be evaluated by our editorial staff. In some exceptional cases, we may have to ask you to send us a sample of your products. If your submission is wholly or partly accepted, you will be asked to proceed with payment and to send the documentation and the sample products needed for laying out the presentation pages, in compliance with the methods and times which will be given to you. It will all be very simple, so don’t worry. But how much will it cost me? The price varies depending on how many of your reference products are included in the publication. The price for one product is €1,000.00 + VAT. All things considered, this is not a particularly large sum for becoming part of world excellence in the field of pasta, is it? Once the publication has been printed, you will receive 2 copies of Eccellenza Pastaria for each of your products presented in the yearbook. Furthermore, you will have the right to use the Eccellenza Pastaria 2016 seal in your company documentation in accordance with the indications which will be given to you. We will take all the necessary photographs of your products, see to the layout of the pages, the translations and everything else needed to ensure the presentation matches the excellent quality of your products. Don’t miss this opportunity, fill in the form below to submit your products for inclusion in Eccellenza Pastaria 2016. Please fill in the form below only if you are truly convinced that you can offer top quality products and that you are prepared, if your products are accepted, to undersign a proper purchase contract and pay for the advertorial spaces assigned. Are you ready? Then what are you waiting for? Fill in the form now for your chance to be featured in Eccellenza Pastaria 2016! Form for offering to purchase advertorial spaces for products in Eccellenza Pastaria 2016. By filling in the form below, I hereby offer Kinski Editori S.r.l., editors of Eccellenza Pastaria 2016, to purchase advertorial spaces for presenting products to be featured in Eccellenza Pastaria 2016. For the 2016 edition of Eccellenza Pastaria, I hereby submit for inclusion products no. The discount will be applied when payment is requested. The first manufacturer from each country accepted to appear in Eccellenza Pastaria 2016 will be offered a 15% discount (not to be accumulated with other offers). Payment: by means of bank transfer or credit card/PayPal, within 7 days of this offer being accepted by the editor. • 4 packs of each product (needed for taking the necessary photos: these will not be returned). • brief description and technical information on each product by filling in the relative sheet which will be provided by the editor. Still not clear? Visit FAQ page or write to us at info@pastaria.it. We will be happy to answer any queries you may still have.